The ruling All Progressives Congress has been banned from fielding candidates for elective positions in Zamfara state for the 2019 elections by INEC. 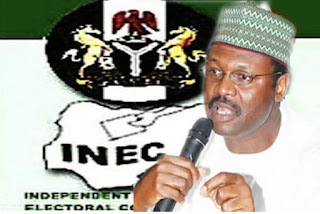 The Independent National Electoral Commission (INEC) has banned the ruling All Progressives Congress (APC) from fielding candidates for governorship, state and federal legislative elections in Zamfara state. The latest development followed the inability of the national leadership of the party and the state government to reach a common ground on the conduct of party primaries before the October 7 deadline given by the electoral umpire. 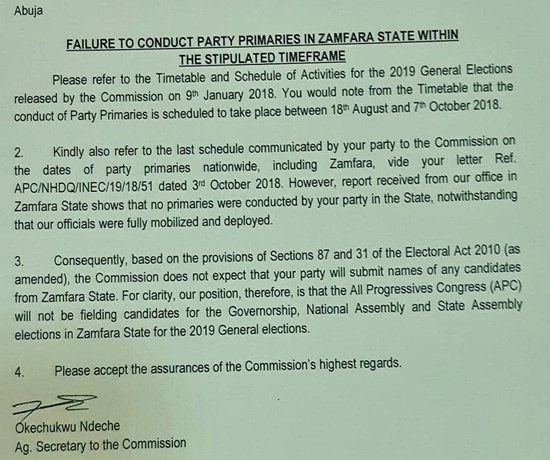 The memo titled, ‘Failure to Conduct Party Primaries in Zamfara state within the stipulated timeframe', reads: “Please refer to the Timetable and Schedule of Activities for the 2019 General Elections released by the Commission on 9th January, 2018. "You would note from the Timetable that the conduct of Party Primaries is scheduled to take place between 18th August and 7th October 2018. "However, report received from our office in Zamfara state shows that no primaries were conducted by your party in the state, notwithstanding that our officials were fully mobilized and deployed. "For clarity, our position therefore is that the All Progressives Congrats APC will not be fielding candidates for the Governorship. 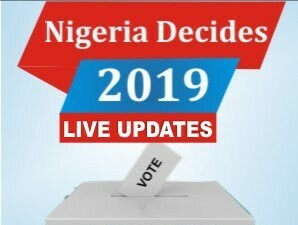 National Assembly and State Assembly elections in Zamfara State for the 2019 General elections.